Dental braces have long been used to correct moderately to severely misaligned teeth. Although traditional metal braces are highly effective for treating many types of bite abnormalities and misalignments, they are not without drawbacks. In fact, our dentist in Torrance warns that dental braces can have some risks. Maintaining good dental hygiene is important for all of us, but it is even more critical for those wearing braces. Plaque can easily accumulate around those metal brackets and wires, and if it is not cleaned off regularly, it can lead to dental decay and gum disease. The wires and brackets can also irritate the tissues of the mouth and increase the risk of sores and inflammation. Of course, not all risks associated with dental braces come from inadequate dental hygiene. Some risks are associated with poorly or improperly applied braces. Reputable orthodontists are always the best option when it comes to straightening teeth, but many people seek out lower cost options when it comes to orthodontics due to limited budgets or a lack of dental insurance. This can lead to nerve damage, choking hazards, blood poisoning and permanent damage to the teeth or jaw. If your teeth are uneven or your bite is off, our specialist for braces in Torrance can provide you with orthodontic options that fit your budget and your lifestyle. 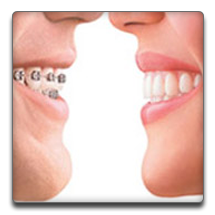 You may be able to choose from traditional metal braces or Invisalign clear plastic aligners. We accept most forms of dental insurance and even offer flexible payment plans in order to keep treatment within your budget. Call us today to learn more or to schedule an appointment.